The kitchen is a great place to work on being more eco friendly and less toxic, and it goes beyond buy local and/or organic produce for your family. How you clean your kitchen matters too. These cleaning products are easy to make and use, and of course you can use them beyond the kitchen when appropriate as well. My favorite! I use diluted vinegar for all kinds of cleaning. There’s a reason why I buy it at Costco and not the grocery store. Besides, Costco’s price is better by about $1.50 for the gallon and a half size than what my grocery store charges. 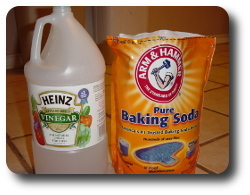 Mix water and vinegar about 2:1 in a spray bottle and use for general cleaning purposes. You can add a few drops of tea tree oil or lavender essential oil to get rid of the vinegar smell. Another alternative is to place orange peels in a jar, then fill with vinegar and wait two weeks. Filter it into your spray bottle and dilute with water, and you have a great smelling cleaning spray. Lemon works as well. Baking soda does some cleaning on its own, but it’s also vinegar’s loyal companion. Baking soda gives that little bit of grit to help with scrubbing. Sprinkle it where you need it, then spray with vinegar to get the fizzing going. The reaction really helps with cleaning. For those times you need soap, castile soap should be less toxic than the usual sorts of dish soap. You can use it as is, or water it down just a touch. For dishes, combine a cup of castile soap, a quarter cup of water. Use as you would other dish soaps when hand washing dishes. If you’re having trouble with a film left behind on your dishes, have vinegar mixed into your rinse water. According to the Dr. Bronner’s website, mixing lemon juice or vinegar directly into the soap just doesn’t work that well. Old towels or burp cloths which aren’t good for anything else are great for cleaning anywhere in the house, not just the kitchen. I have a bin full of old burp cloths, most of which have been in use since my 10 year old was an infant, first as burp cloths, but now for general cleaning. They work great. You can cut up larger towels for use as rags when they get too old too. Think about what sizes you need, and trim by your preferences. I hate mopping floors, but using a steam mop makes it more pleasant and doesn’t require anything other than plain water. I like that. 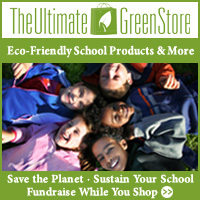 Haan and Enviro Steamer are both considered good brands and are reasonably priced in my opinion. When you have tough foods to get off, an old credit card is pretty effective as a scraper, as are similar cards. Obviously you have to be more careful about leaving it out, especially if it’s expired but otherwise a current card number. If you have a card of the same sort of material as a credit card but without such risk to your personal information, it will be a far better choice. Some store loyalty cards may be appropriate, especially if you use your phone number rather than your card when you’re at the store anyhow. Antibacterial products have great marketing, but the way most people use them, they aren’t as effective at killing bacteria as many think. In fact, antibacterial soaps may kill only about as many bacteria as regular soaps. With the environmental hazards of triclosan, it’s better to skip the antibacterial soaps. Published by Stephanie, in Cleaning Products. I find one of the benefits to making my own cleaning products to be that I don’t have to search for things that aren’t marketed as antibacterial. It never ceases to amaze me just how paranoid many people are about germs because the commercials have told us to fear them. Exposure to germs is normal, after all, and within reason a healthy thing for you. You can’t build up immunity to things you aren’t ever exposed to. Wandering around online, I came across this article from last year on the difference between how regular cleaners work and how antibacterial ones work. The more traditional soaps and such simply loosen up dirt and such so they could easily be wiped away. They don’t tend to leave residues. Antibacterial products, on the other hand, generally do leave residues. This can encourage the development of resistant bacteria. I’m sure many of you know that resistant bacterial diseases are a problem already due to overuse and misuse of antibiotics in medicine. Too many parents demand antibiotics when they aren’t the answer, and many people don’t use the full prescription, allowing the more resistant bacteria to survive and reproduce. Frankly, I’d like to avoid having the same thing happen in my home. That’s why I don’t use antibacterial products. If regular cleaning can simply get rid of them, what more do I need? Worse, antibacterial products like triclosan are contaminating the environment already. That’s more chances for bacteria to develop a resistance to these things. These are very simple reasons to avoid antibacterial products, I think. At the very least they’re good enough reasons for me.